These precision machined Billet Aluminum Spacers allow the use of 9.800" deck intake manifolds with 10.200" blocks. 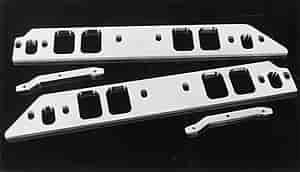 End rails are also supplied for a sure seal of intake to block and heads. What is the oval port size, 2.05&quot; x 1.82&quot;? Yes, those are the approximate sizes for this, it is made to be port matched.